Three of the top point producers on the high scoring Sault College Cougars of the American Collegiate Hockey Association are recent graduates of the Northern Ontario Jr. Hockey League. 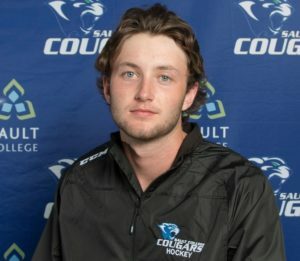 Forwards Mark Tassone (Soo Thunderbirds), Max Khull (Blind River Beavers) and Austin Rowe (Soo Eagles) all opted for the education and hockey route at Sault College this season despite having junior eligibility remaining. Tassone and Khull both have 1999 birth dates while Rowe was born in 1998. Sault College is a powerhouse team within the Division 3, ACHA as the only Ontario school in the entire program that includes more than 140 schools from coast to coast. The Cougars are one of 27 schools that compete within the North Division of the ACHA. Thus far this 2018-2019 season, Sault College has a record of 14-2-1 and has out-scored the opposition by a 129 to 59 margin in 17 games, 15 of which have been been played on the road. As for the aforementioned, recent NOJHL graduates, Tassone is tied for second on the Sault College scoring chart with Khull. Tassone has 7 goals, 24 assists, 31 points while Khull has 6-25-31 numbers, just ahead of Rowe, who has 15-12-27 totals. Cougars head coach Mike Hall said that the NOJHL is the number one junior league that Sault College looks to when recruiting student hockey players. As for Tassone, Khull and Rowe, they all had opportunities to leave their Sault Ste. Marie area homes to play at the National Collegiate Athletic Association and/or Canadian university levels but chose Sault College to enroll in the reputable Police Foundations program while continuing to play hockey. Being a good student is a top priority when the Cougars are recruiting hockey players, said Hall. “You don’t want to bring in a good hockey player who doesn’t have good marks and have him flunk out after one semester,” Hall said evenly. As Hall tends to coaching, the majority of the recruiting is in the hands of Sault College manager of hockey operations Mark Hebert and scouts that include venerable NOJHL bird dog Charly (Old Goat) Murray. “As a coach you are only as good as your players and Mark, Charly and others on staff do a great job of recruiting,” Hall added. Murray has been involved as a junior hockey scout for parts of five decades and loves having three NOJHL teams in the backyard of Sault College in the aforementioned Soo Thunderbirds, Soo Eagles and Blind River Beavers. Meantime, the previously mentioned troika of Tassone, Khull and Rowe are only three of several NOJHLers who are in school and playing hockey at Sault College. Before arriving at Sault College, Barbeau moved on from the NOJHL to play in the Greater Ontario Jr. Hockey League while O’Flynn suited up for teams in both the Central Canada Hockey League and Ontario Jr. Hockey League, Thrower skated in the Superior International Jr. Hockey League and Pullicino finished up his junior career in the Greater Metro Hockey League. The Cougars are fresh from their first two home games of the 2018-2019 season, which were resounding 10-2 and 9-1 wins over the Oakland University Grizzlies before big crowds at Rankin Arena. To be sure, Sault College has the makings of an ACHA national championship tournament team. Hall, by the way, has brought many years of high-end coaching to Sault College as a former multiple championship bench boss with the Soo North Stars of the Great North Midget Hockey League. This marks the Cougars second season as full fledged members of the ACHA. But as relative newbies, Sault College is forced to play the majority of its games away from home. However, the Cougars do have two more home games coming up. Sault College is scheduled to play host to Saginaw Valley State University on Friday, Dec. 14 at 8 p.m. and Saturday, Dec. 15 at 3 p.m. at GFL Memorial Gardens. Leading the Sault College scoring parade is forward Ryan Vendramin, who has put up remarkable point totals thus far this season. The 23-year old Vendramin, who previously played for Coach Hall with the Soo North Stars midgets before going on to become a draft pick of the Sarnia Sting and play in 20 games over parts of two Ontario Hockey League seasons, has been lighting up the ACHA in a big way. 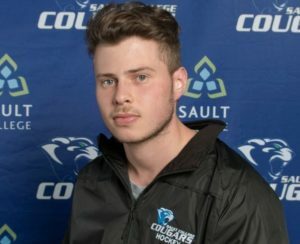 Vendramin has played in 15 of Sault College’s 17 games thus far in 2018-2019 and has put up eye-popping totals of 31 goals, 22 assists, 53 points. As for the Sault College hockey program itself, both the aforementioned Hall and Murray are quite impressed. “It has been first class all the way from administration to the athletics department on down to the hockey staff led by Mark Hebert,” said Hall. “As a staff, we all work closely together, Mark, myself, the assistant coaches and scouts. And Murray noted that “it is great to have the support of the school as we try to build up a reputable hockey program. And as for working with guys like Mark (Hebert) and Mike (Hall), it is nice to be able to have your opinions heard and your input valued. PHOTOS: Mark Tassone (top) and Max Khull of the Sault College Cougars.